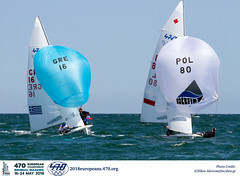 Fourteen teams representing Italy's young 470 talent competed at 2015 Regata Nazionale 1, held from 6-8 February 2015 at Club Velico Crotone in southern Italy. This series of national events establishes the Italian 470 national ranking list. Headlining the fleet with 4 races wins from 6 races were the world ranked #46 pair, Matteo Capurro/Matteo Puppo, with a 3 point margin over second placed Emanuele Savoini/Enzio Savoini who sit on a world ranking of #50. A big 12 point gap to the third placed Niccolo Bertola/Jacopo Izzo, world #74. 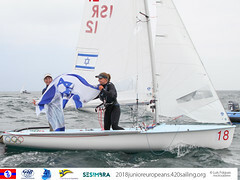 Fifth overall and top placed women's team were Roberta Caputo/Alice Sinno, who also rank as Italy's best 470 women pair, carrying a world ranking of #23. Race day 1 and a light variable breeze. Back to back wins from the three races to Capurro/Puppo, put the pair in the lead, second to the Savoini brothers, and the new women's pairing of Sara Cotto di Vettimo/Sveva Carraro in third. Day 2 served up more light and variable wind, under a blue sky, but chilly. Three races were scheduled, but the inconsistent breeze forced the Race Committee to make do with just two. A 6th and 3rd for Capurro/Puppo easily kept them at the top of the leaderboard. Sunday dawned with more light breeze, and a bit of a drift. 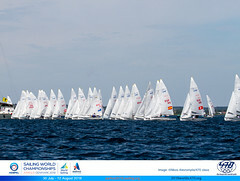 Another win to Capurro/Puppo sealed their overall victory, as the wind disappearing calling off all racing for the day. The next national ranking event is 2015 Regata Nazionale 2 from 13-15 March 2015 at Circolo Velico Pietrabianca.